This post brought to you by IZZE. The content and opinions expressed below are that of Olive and Tate. Just a few weekends ago, Justin and I were thrilled to open our home to host a Gender Reveal party for our friends, Ashley and Andrew. We were all dying to find out if the sweet babe was going to add to our little tribe of boys or if we are going to welcome a girl to our tailgate crew. Ashley and Andrew (and their families!) took care of the hard/most important stuff by ensuring all of the guest were well fed which left me time to play with the fun stuff - the details! I had so much fun putting together a fun, simple and gorgeous scheme for the event that I just had to share. I decided to skip the traditional/themed gender reveal gear and go with fun patterns that included shades of pink and blue. I managed to snag everything from stripes, metallics, scalloped edges, sequins and confetti and it all came together for a fresh, fun look. Because I wanted to mix and match, I was able to grab all of my supplies on normal errand runs at Target, Hobby Lobby and my local drug store, making the prep process super efficient, which is about all I can manage with a toddler in tow. I still wanted to make sure I had a nod to the traditional "boy or girl" theme so I did all of my florals (purchased from the grocery store!) in pink roses, blue hydrangeas and white tulips. Simple, easy and really pretty. It's safe to say that if you're in the stage of life where you're hosting a gender reveal, you should go ahead and plan on serving a fun non-alcoholic beverage when you're friends are around. I never know who might be in the early stages of a pregnancy (and wants to remain incognito) but I do know that half of my friends are nursing, trying to conceive or have a bun in the oven. I like to make it easy on all of us by having a mama friendly drink on display, front and center. For this party, I went with IZZE Sparkling Water in Mandarin Lime and Blackberry Pear. The IZZE Sparkling Waters are certified organic, made with cane sugar and the sparkling water fizz makes them a win for any occasion (but especially one where mamas-to-be are guests of honor!). Without a doubt, the most important detail of the entire party is when the babe's gender is finally made public, so it's worth taking a moment to consider and prep the space where the parents-to-be will get the news. Ashley and Andrew settled on confetti cannons filled with either pink or blue confetti for the big moment, so I knew we would need to be outside. I decided to set up a ribbon backdrop in the area of the yard that I knew would be in the shade, would photograph well and could accommodate our crowd of on-lookers. The backdrop looked incredibly pretty in photos and honestly was just so simple to make. I purchased spools of ribbon in shades of blue, pink and cream (I mixed widths and colors, I wasn't picky) and simply tied them to the branches of the trees in my yard. Set up took maybe 15 minutes and clean up took maybe two! While all of the party guests pointed their cameras and phones on the parent-to-be, I snuck to the side and took photos of the crowd as they found out the news. The reactions were just so priceless - from complete shock to tears. I kept snapping as Ashley and Andrew were congratulated, grandmothers hugged each other and my kid started eating confetti off of the ground. I was really excited to give those particular photos to Ashley and Andrew so that they could see just how thrilled everyone is for this new life to join our wild world. I can't wait to meet this sweet baby girl! 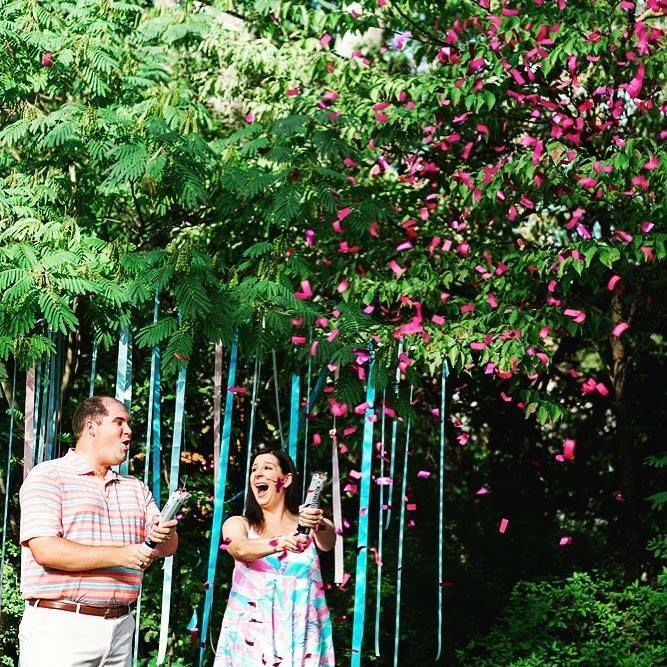 If you've hosted a Gender Reveal, what was a must for your party? Thanks again for a beautiful setting to host our reveal and baby girl's first party! She can't wait to meet her Aunt Steph! Love it!! So cute. Where did you find those striped straws? he he he I couldn't figure out where and why all those pink pieces of "trash" were in the yard when I was there. The details are very cute! Also, it's totally weird that I know someone in the background of those pictures from back in my days at Clemson!